WASHINGTON – President Donald Trump imposed tariffs Friday on $50 billion in Chinese products, signaling his willingness to unwind nearly a quarter century of growing commercial links between the world's two largest economies unless Beijing agrees to transform the way it conducts business. The decision marked the president's boldest step so far to implement his "America First" strategy, which he promises will shrink the $811 billion merchandise trade deficit and return lost manufacturing jobs to the United States. But Trump's aggressive approach is rattling American corporate leaders and his Republican allies in Congress, as Chinese officials show no sign of capitulating. It took little more than an hour for the Ministry of Commerce in Beijing to fire back at the president with a late-night statement pledging to erect trade barriers of the "same scale and the same strength." China is targeting agricultural goods, cars and energy in a bid to hit the president's supporters in farm states and the industrial Midwest. Since the mid-1990s, when China's entry into the world trading system was first broached, multinational corporations have grown highly dependent upon Chinese factories. Over the past decade, two-way trade between U.S. and Chinese ports has grown by two-thirds to nearly $700 billion annually. "Given China's unwillingness to capitulate to U.S. demands, it is difficult to see a path to a negotiated settlement that avoids a big hit to trade and investment flows between the two countries," said Eswar Prasad, former head of the International Monetary Fund's China division. "Trump's trade sanctions constitute a significant strike against rising global integration." Administration officials say the tariffs are needed to compel China to modify elements of its state-led economic system that disadvantage private companies. Efforts over several years to persuade Beijing to reduce the government's role in key industries and drop special requirements placed on foreign companies have failed, they said. "We had two systems, which were supposed to converge after China joined the [World Trade Organization] in 2001 into two market economies. What we got was a much larger Chinese nonmarket economy that has become structurally different in ways that threaten U.S. economic prosperity and national security," said a senior administration official, who spoke on the condition of anonymity to discuss the president's thinking. Trump appears to be gambling that the imposition of tariffs – even if it triggers a retaliatory spiral – will force China to surrender. 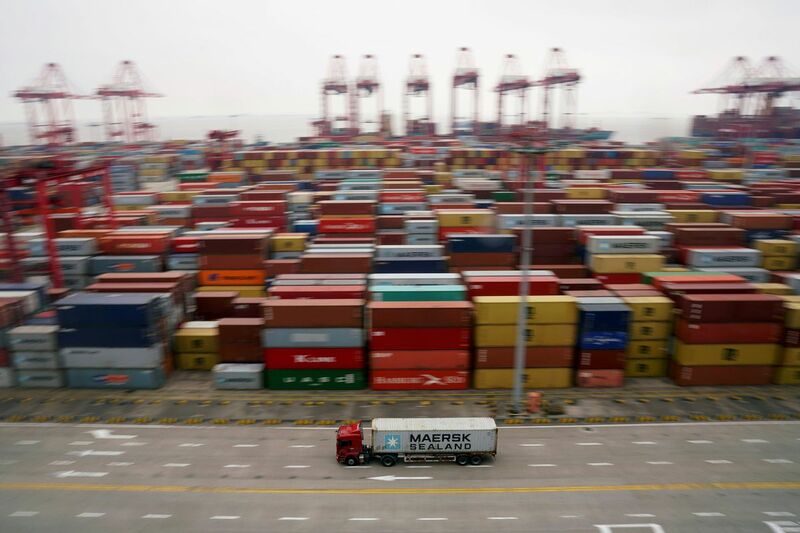 Administration officials are confident that China needs the $20 trillion U.S. market more than American businesses need China – and that China has more to lose from a trade war, given that it enjoys a trade surplus. Trade measures designed to punish China also will hurt other countries, including U.S. allies, as well as American companies. Roughly 60 percent of the $505 billion in goods the United States imports from China originates in the Chinese affiliates of multinational corporations, according to economist Nicholas Lardy of the Peterson Institute for International Economics. "I can't imagine that the Chinese are going to back down," said Lardy. "China is likely to prevail, and Trump will have to find some way to back down." U.S. and Chinese officials in recent weeks had made progress on a deal that involved up to $70 billion in additional purchases of American products. But the Chinese offer was now "invalid," the statement from Beijing said. Many lawmakers, including some such as Sen. Marco Rubio, R-Fla., who have been critical of the president, issued public statements backing the tariffs. "The president's actions on China are on the money," said Senate Minority Leader Charles Schumer, N.Y. "China is our real trade enemy, and their theft of intellectual property and their refusal to let our companies compete fairly threatens millions of future American jobs." But many lawmakers, while welcoming action against China, are worried about potential escalation. "We support the president standing up to China," said Rep. James Comer, R-Ky., who represents a conservative rural district. "But . . . we're concerned because agriculture is on the front line of this trade war." Friday's action follows an administration report in March that complained China had forced foreign companies to surrender their technology secrets in return for market access and had pilfered other advanced U.S. technologies through a campaign of cybertheft and investment in Silicon Valley startups. "These practices . . . harm our economic and national security and deepen our already massive trade imbalance with China," Trump said in his announcement of the tariffs. The United States last year ran up a $375 billion deficit in goods trade with China, a figure the president blames on Chinese trade barriers. Most economists say the gap is the result of broader forces such as Americans' low savings rate. On April 6, the administration published a proposed list of 1,333 products targeted for tariffs. After hearing objections from business groups, U.S. Trade Representative Robert Lighthizer dropped 515 items and added 284 new ones. "These tariffs are essential to preventing further unfair transfers of American technology and intellectual property to China, which will protect American jobs," the president said. Most of the semiconductors imported from China are returning to the U.S. companies that design and produce them after undergoing limited and low-value work done in China, the group said. "The Chinese are going to be sitting back and laughing that the Americans are putting tariffs on themselves," said an industry executive, who spoke on the condition of anonymity because he was not authorized to speak to the news media. The Chinese government is pursuing a $300 billion program of subsidies to enable its companies to dominate next-generation technologies such as artificial intelligence, robotics and quantum computing, upping the stakes for Trump's efforts to preserve U.S. technological secrets. "This is not market capitalism," the official said, speaking on the condition of anonymity to brief reporters. "These are state policies where they are targeting certain industries." Trump's complaints about China's trade practices are shared by many business leaders. But there is little support for using import taxes, which are paid by Americans, as a tool against the Chinese. "Imposing tariffs places the cost of China's unfair trade practices squarely on the shoulders of American consumers, manufacturers, farmers and ranchers. This is not the right approach," said Thomas J. Donohue, president and chief executive of the U.S. Chamber of Commerce. The U.S. announcement comes at a complex juncture in U.S.-China relations. Following this week's summit in Singapore between Trump and North Korean leader Kim Jong Un, Secretary of State Mike Pompeo stopped in Beijing for meetings with Xi and other top Chinese leaders. On Thursday, Pompeo thanked Xi for China's help with North Korea and even wished the Chinese president a happy birthday. But at a news conference with China's foreign minister, Wang Yi, tension over trade was clear. Pompeo said the U.S. trade deficit with China is still too high, and Wang called for Washington to make a "wise choice" on tariffs. After Trump's statement Friday, Lu Xiang, a trade expert at the Chinese Academy of Social Sciences in Beijing, warned that relations between the two countries were heading to their lowest point since China began its economic reforms in the late 1970s. "This is like holding up a pistol, putting the finger on the trigger," he said of Trump's actions. "It's just one step away from pulling the trigger and firing the pistol. It's a very dangerous and sensitive moment now." Rauhala reported from Beijing. The Washington Post's Erica Werner in Washington and Luna Lin in Beijing contributed to this report.